For the second day of Sandwich without Bread, I have yet another of my long on to do list, Ice Cream Sandwich Cake. Since a couple of years, this cake has been the rage and everybody wanted an Ice Cream Sandwich Cake. I have not tasted the commercial one fearing that eggless ones are not available. Even the place where we do get I end up getting a truffle cake. When I thought of this theme long and hard, I wanted something that will be enjoyed by all. Naturally, cakes to mind and since we always stock ice cream, I thought I would make use of it, and make eggless cakes for the layers. I always go for Microwave cakes as they get done in a breeze. Plus I was going to use the sugar syrup, so even if it was going to be frozen, I knew the layers will be moist. That was also one of the reasons why I used oil and not butter. As with all layer cakes, this cake needs some protein to stand, so you have milk and curds added. Anyway, the cake turned out super moist yet firm. I haven’t checked if I already have this measurement posted. I decided I would write it down anyway. If you want to make your own Ice cream, then you can make this No Churn Chocolate Ice Cream and Vanilla Ice Cream. The very popular Ice Cream Sandwich cake is made easier by making it in Microwave Oven. Except for freezing and waiting, the baking and assembling hardly takes time. Best for Parties. Bring to boil the water along with sugar until melted, then cook in low flame till it thickens. 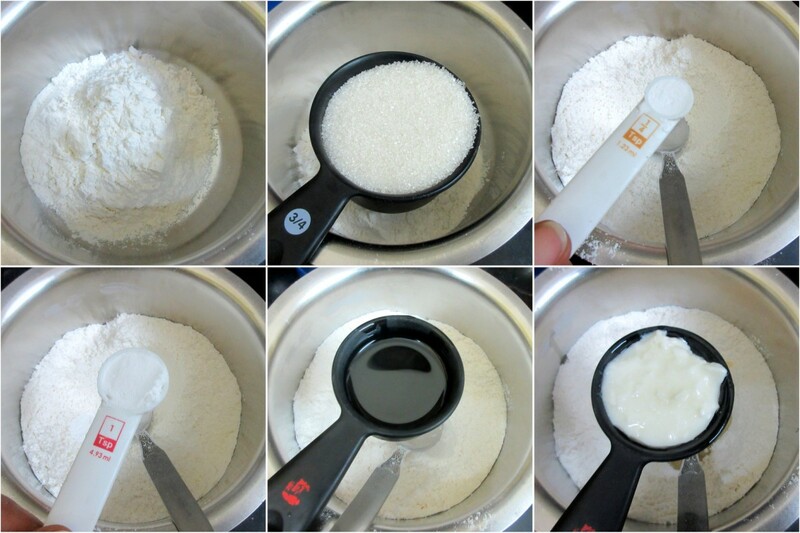 In a bowl take the flour, baking powder, baking soda, sugar, salt and fluff well. Next add oil, vanilla essence, curds, milk and blend well. Finally add 1/4 cup water, mix. Then slowly add the rest of the 1/4 cup depending on how thick your batter is. I had to use the whole of 1/4 cup as microwave cake batter needs to be little loose. Remove 1/2 cup of the above batter for making chocolate batter. Mix in cocoa powder and combine gently. Grease the bowl with ghee, pour half of the batter using 1/4 measuring cup and Microwave for 1 min 20 secs. Rest for a minute and transfer to a plate. Repeat till you are done with both the batters. Meanwhile, make the sugar syrup till it thickens. When the cake is done and resting, prick with fork and pour the sugar syrup over the cake. Scoop the required Ice creams to a bowl and let it stand to become soft or you can spread it well. Take the chocolate layer first, spread Vanilla Ice Cream evenly, sprinkle the dark Chocolate Chips over it. Press the vanilla cake over this, spread the chocolate ice cream evenly, then layer it with Chocolate cake. Repeat another layer of vanilla ice cream, dark chocolate chips. Finally, press in the vanilla cake. MW the cream for a min, add chopped dark chocolate compound, MW for 30 secs. Whisk well till mixed completely. Ganache will thicken when cooled, else you can MW for another 30 secs. When the cake is frozen, remove and quickly spread the ganache all over the cake and freeze until serving. I used a 6 Inch Microwave safe bowl that was greased with Ghee for the cake to slide out. You can use butter as well. Tempting one..drooling Valli, seriously I want to eat just one piece of that cake. very lovely cake. would be a hit with ice-cream and cake lovers. Very sinful!! Prefect sandwich cake for my sweet tooth, just want a super huge slice to enjoy rite now. Now u are tempting me to make this cake. Yes Valli I have seen this all over. Lovely that you made your own version at home!! Such a tempting sandwich with cake and ice cream Valli. Good one for the theme. 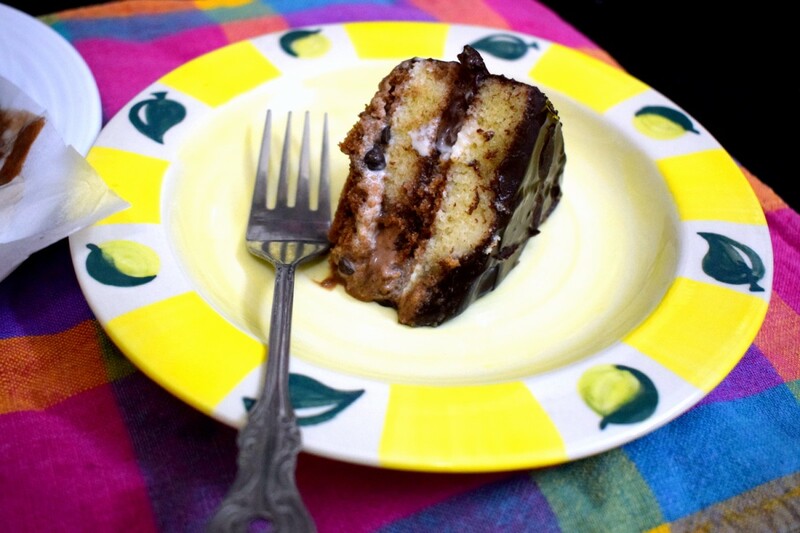 Such a decadent icecream sandwich cake! !